The neighborhood operations calculate output values by calculating a specified statistic to all the input cells that are contained in each neighborhood. The neighborhood is a moving window that iterates through the input data. There are two basic kinds of neighborhood operations in Spatial Analyst: the operations where the neighborhoods of the processing locations overlap and those where the neighborhoods do not overlap. The Focal Statistics tool processes the input dataset with overlapping neighborhoods. The Block Statistics tool processes data with neighborhoods that do not overlap. 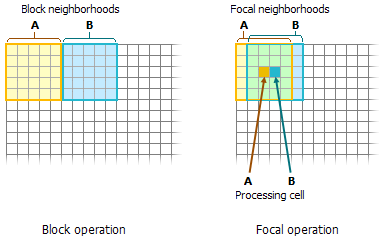 In the focal operation, only the processing cells receive the result of the calculation of all the cells in the neighborhood, whereas in the block operation, every cell within the minimum bounding rectangle that contains the neighborhood receives the same output value. The defined neighborhood shapes that can be specified are a rectangle of any dimension, a circle of any radius, an annulus (a doughnut shape) of any radius, and a wedge in any direction. In addition to these geometric shapes, you can also create an irregularly shaped neighborhood, often called a kernel, where you can control exactly which cells in the neighborhood will be included in the calculations. Further, you can also apply different weights to specific cells in the neighborhood. Cells in the input raster that fall within the specified neighborhood will be included in the calculations being performed for that neighborhood. For Focal Statistics, the result of the calculation is applied only to locations corresponding to the processing cell on the output raster. For Block Statistics, the result of the calculation is applied to all cells that are within the processing neighborhood.